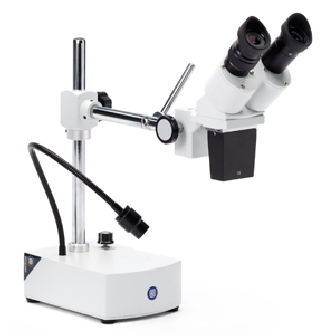 Ideal microscope for a variety of QC applications including electronics and materials inspection allowing sample to be placed or hand held to view. Long arm stand with weighted base for stability. The user enjoys bright white light due to the innovative LED light source on the flexible and adjustable arm. Additional eyepieces and objective set options for wide magnification range.